Employee surveys are great, but they don’t mean much if no one’s participating. Companies often spend an incredible amount of time and energy on creating employee surveys, but there is usually very low participation. Based on research I’ve seen, 30% is the average response rate for employee surveys. I think that there are two things, from a high level, that affect these low participation rates. I’ll discuss both of these in more detail throughout the post, but first, I think it would make sense to look at some data around employee surveys to get a sense for why employee survey participation rates might be so low. I’d like to go through some statistics around employee engagement surveys, and talk about them one by one. There is some great research out there on why most of them don’t work and why employees see them as a waste of time. These statistics are from an infographic that Officevibe created about employee surveys. I’ll admit that this isn’t a huge number, but it’s still a very telling statistic. If managers don’t take them seriously how could employees possibly take them seriously? I have a feeling that these numbers come from mid-level managers that are excluded from the process. They’ll be mandated to give surveys to their employees with very little explanation or input. If companies would involve more people in the process, they would look at it less this way. All managers at all levels need to be at least made aware of the goals behind the surveys. Is this simply a reaction to something negative? 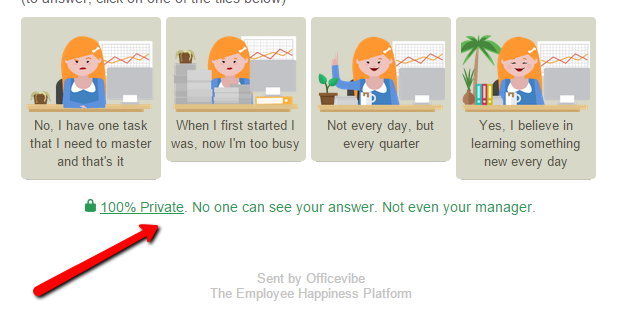 Are they trying to continuously measure employee engagement? Understanding the purpose behind these surveys should help with this statistic. Like I mentioned at the beginning of the post, this is the average response rates for employee surveys. Imagine how much time and energy goes into these surveys, only to have most of the organization ignore it. The key question that you need to be answering is “what’s in it for me?”, why should employees want to answer the survey? Many companies will offer up incentives or other prizes, but I’m not sure if that’s the best approach, because it still doesn’t answer the “what’s in it for me.” Why should employees care about that incentive you’re offering. If you can offer something meaningful, then I’m all for it. Naturally, my opinion is biased, but I’m a big believe in short surveys that are no more than ten questions long. If you’re creating your own survey from scratch, you should take the survey yourself before sending it to employees to test how long it will be. Eliminate any question that isn’t absolutely necessary, and really be strict with yourself to delete as many questions as possible. While this might seem obvious, it’s worth mentioning. If you’re using your own internal survey software, allowing employees to skip questions is an important part of making sure they’re able to go through the survey quickly and answer whatever is relevant to them. As a leader, it’s important that you communicate to employees why it isn’t pointless. Tell them that their voices will be heard and that your company will act on whatever feedback is given. You should also mention to them that they shouldn’t be scared to be honest with their answers. Actions speak louder than words though, so if you can prove to them over time that you’re listening to what they’re saying, you’ll be okay. Again, there is a lack of trust, and a lot of skepticism towards the process. Most employees feel like managers won’t even do anything with the data, so what’s the point of participating? This might take some time to do, since trust is built and earned over time, but it is possible to make employees feel like their voices will be heard. I’ll go into more detail on this later in the post, but earning employee’s trust is the key to this. Help remove that skepticism so that they’ll take it more seriously. This is a common theme throughout all of these statistics. Managers don’t take these things seriously enough, when they warrant being taken very seriously. This data is gold, and will give you deep insights into your employees and how they feel. Like I mentioned at the beginning of the post, one of the key reasons I think participation rates are so low is because of a lack of trust in the organization. There is a lot of fear around how the data will be used. Are the surveys truly anonymous? Will I get in trouble or fired for speaking the truth? Will my managers even do anything with the results? If not, then what’s the point? So as leaders, how can we build trust in our organization? It’s possible, but it does take time. Trust is earned, and as a leader, you need to prove yourself to employees a few times before a true sense of trust is established. David DeSteno, a professor of psychology at Northeastern University and author of The Truth About Trust, says that as a person’s power increases, their perceived trustworthiness goes down. This is usually because they’re more removed, and have less of a personal connection with employees, which is easier to have if you’re a direct manager. In the book, DeSteno talks about six rules for building trust. The sixth rule is the one I’m going to focus on. It’s “Cultivate trust from the bottom up.” For managers, that means delegating tasks and giving employees as much autonomy as possible, while also making it clear what your expectations are and how performance will be measured. People will trust you if you trust them. Employees will resist the idea that the surveys are beneficial to them, so you need to be incredibly transparent, and communicate with them from the beginning, even before you send out your first survey. Before conducting an employee survey, you need to be ready to act. I think it’s a much smarter idea to spend less money on a vendor and designing the survey itself, and spend more on the action plan. The trick is to prepare for all of this before you even start the survey, so that you’ll be ready to go as soon as the survey is over. A question we often get at Officevibe is, won’t employees eventually stop participating? How do you ensure that they’ll keep coming back? Not to shift the blame, but I often tell whoever is asking me this that it’s mostly up to them. As long as the questions that the system is asking are fun and different, I assume that we’ve done our job. What I always say is, if employees get the sense that management is actually doing something with these results, then in theory, they should continue to participate. In Officevibe’s case, we ask employees questions every week, so the action plan needs to happen much faster than if it was a traditional annual survey. With that in mind, I always recommend to managers that they test small changes in one or two very specific areas. If your employees took the time to respond to your survey, you need to show them appreciation and thank them quickly! Don’t wait too long to thank them, your employees won’t like that. Make sure at the very least you thank them for participating, and let them know that you’re listening and will take whatever they said seriously. Like I’ve mentioned earlier, most of the time nothing happens with a survey, or employees don’t believe anything will happen. One big reason for this is because the action plan falls on a manager’s lap and it goes to the bottom of their priority list. You can easily fix this by involving employees in the process. As humans, our tendency is to focus on the negatives (this is known as negativity bias), but it’s important to highlight some positive feedback that came out of the survey. It will help make employees feel proud of where they work and proud that they took time to answer. After you’ve decided on a few things to implement, make sure that you communicate with your employees and ask them for further feedback. Remember that the whole point of doing the survey in the first place is to have a dialogue going between you and employees, so make sure to keep that dialogue going throughout the entire process. Get our weekly tips on how you can keep your employees engaged. You need to be creative in how you go about this, but here are a few simple ideas that you can use to increase participation rates. I would say that concerns around anonymity are the biggest reasons for a low response rate, or inaccurate data. For example, if I’m worried that the responses won’t be anonymous, chances are I’ll report stronger feelings about my boss than I truly feel, or I might not respond at all. It’s important to understand that we are acting as a middleman, protecting both parties. It’s also important for employees to understand that if their company has signed up for Officevibe, it’s because they’re genuinely trying to figure out what’s wrong with the organization, in the hopes of improving it. Tell employees that it’s okay for them to be honest, you want them to be a part of the process, and explain to them the point of the survey. In most cases, these types of questions are only answered to senior level staff. This is the wrong approach. Your front-line employees are the ones who know what’s actually going on, so if anyone should know these things, it’s them. A really interesting study by researchers in the Netherlands about incentives in surveys found that vouchers seem to be the most effective incentive in long questionnaires, while prize draws are more efficient in short surveys. A follow-up study revealed that prize draws with small prizes, but a higher chance of winning are most effective in increasing the response rate. Ideally, you shouldn’t have to offer incentives though, I’m just suggesting this idea in case other things don’t work. I think it would be better for you to save your money, and build a culture of open and honest feedback where the fear is removed from employees. Studies have shown that employees are more sensitive than consumers to survey length and that survey length was one of the main reasons for employees not responding. At Officevibe, our software asks employees five questions a week, and we’re very focused on making it as quick and easy as possible. We want to give managers just enough data while trying not to disturb employees. How Do You Improve Employee Participation Rates? Any advice or tips you can share? Let us know on Twitter @Officevibe.